Meet Yaris R4. Built by Evolve Motorsport with Oreca’s R4 kit. 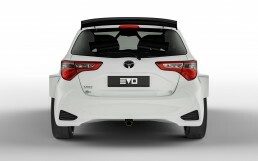 Yaris R4 EVOLVE is designed to enter all kinds of FIA Rally championships worldwide including regional FIA events. Ultimate driving experience for a fraction of the price of R5. Drivetrain: AWD with Sadev differentials, robust transversal and longitudinal shafts. The R4 class was added to the FIA World Rally Car hierarchy to fill the gap between front wheel drive R3 category and the all wheel drive R5 class. All R4 category cars are equipped with an universal kit that consists of a turbocharged petrol engine and a AWD transmission. R4 cars will be allowed to enter all kind of championships worldwide including regional championships. While the price of the Yaris R4 is 20% lower than any R5 car, the running costs are something to look for. Designed with a focus on reliability and serviceability Yaris R4 provides up to 40% cheaper driving than the R5. 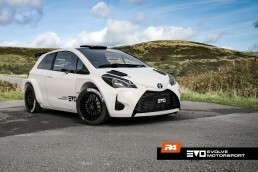 It takes around 3 to 4 months to deliver Yaris R4. Contact us & we will provide you the schedule & pricing information. R4 configuration is well defined by the regulations, however there are some areas, which can be individually tailored. You can choose your favorite dampers and cockpit equipment. 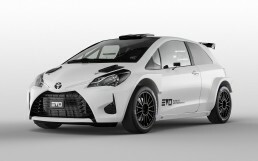 Yaris R4 is built on mass production model of Toyota Yaris (3 door), using rally ready R4 kit from Oreca and our custom parts. The complete chassis is prepared by Evolve, while Oreca R4 kit provides engine, transmission, differentials, front & rear axles, brakes & fuel system and complete electronics. The car is assemled by Evolve’s engineers. Your safety is Evolve’s top priority. 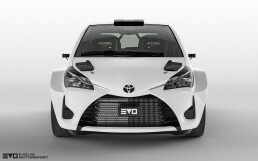 Yaris R4 is equipped with FIA certified roll cage, energy absorption foam for lateral protection, as well as FIA approved fire extinguisher system and cockpit equipment. It provides the same level of protection as every R5 car. Before we deliver your car, we recommend test session aimed to fine tune car’s setup to fit your specific requirements. This will ensure you the complete & working package starting from the very first kilometers. The procedure is supervised by European Rally Champion – Wojtek Chuchała.